Columbia Police Chief W.H. ‘Skip’ Holbrook announces that CPD officers are investigating last week’s suspicious death at a Forest Drive restaurant as a murder and have identified a suspect in connection with the incident. 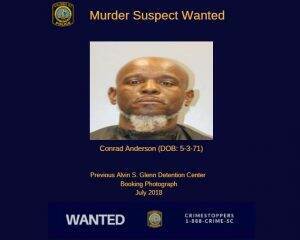 Investigators want to locate Conrad Davin Anderson (DOB: 5-3-1971). Once arrested, he will be charged with Murder. The warrant information has been entered into the National Crime Information Center (NCIC) database. Anderson and the victim who’s been identified by Richland County Coroner Gary Watts as Charles Crane were acquaintances and argued moments before the deadly incident on April 5, 2019 at the 5400 block of Forest Drive. According to Coroner Watts, Crane died as a result of blunt force injuries and was found deceased outside of the San Jose restaurant.